And it’s not too difficult to get there, either, with a little bit of research and determination. It’s a small town, but they do have their fair share of tourists. My preparations started long before landing in Bergen, and they started very broadly. 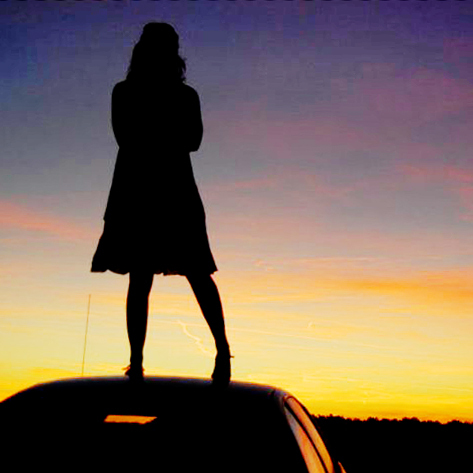 I had three-and-a-half days to do whatever I wanted, and I wanted to do something fun. I really didn’t know much about Norway, so I started with Wikipedia. Norway. Bergen. Fjord. After learning the basics, I started looking at different things I could do in and around Bergen. Paragliding, whitewater rafting, skiing—it’s paradise for anyone who enjoys the outdoors. I narrowed my focus to the Hardangerfjord region, as it seemed relatively accessible from Bergen. I then narrowed further to a hiking trip, learning that Norway has excellently maintained trails with self-service cabins along many of them. This website goes into detail about the trails, like this page about the trail I took. Den Norske Turistforening—the Norwegian Trekking—also has centres to give people information. The people are beyond friendly. 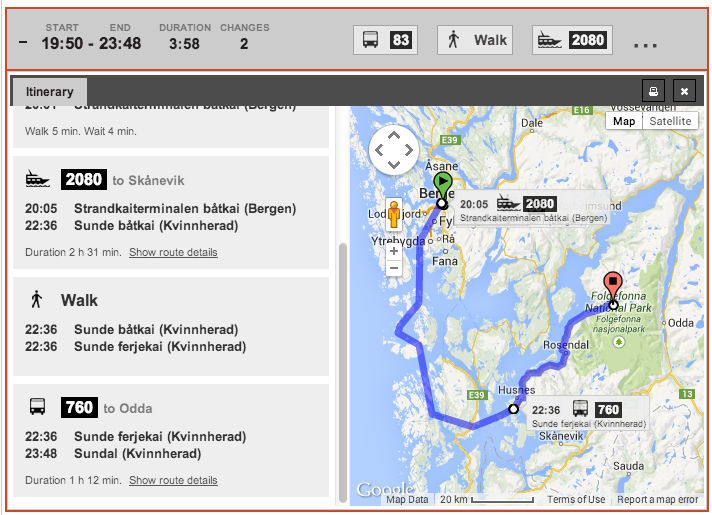 I picked up my detailed map for the hike at the centre in Bergen, along with fuel for my camping stove. Here is the website I used to find my transportation details. Sure, you may find yourself waiting on the side of a road as I did, where the only passersby are tractors and sheep—but if you’re as lucky as I was, the bus will come on time. I chose the trail from Sunndal to Fonnabu for several reasons. One. It was easy to get to from Bergen, and included a spectacular sunset ferry ride. Bergen to Sunndal, on the evening ferry. Two. The path progressed from easy at the beginning to advanced through the second half, and there were stopping points along the path in the event I couldn’t go further. The hike from Sunndal to Fonnabu. Three. If the path was so undoable that I couldn’t even begin, there was a nice nearby day hike I could do to the Bondhusvatnet hike and check out the glacier Bondhusbreen. Four. 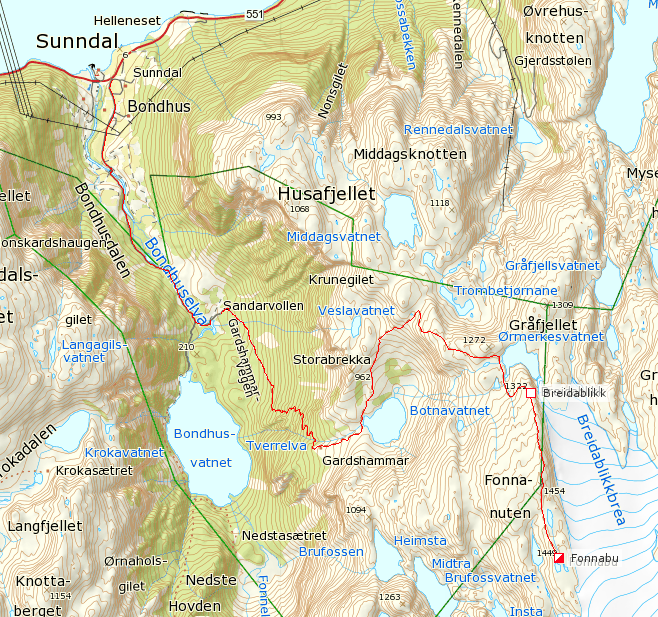 There was a campsite in town, the aptly named Sunndal Camping, if I were feeling lazy. One snag was that the path was marked as a summer trail, best done from June through the summer. Nonetheless, I decided to give it a go. Before embarking, I didn’t find too much of is English blog posts explaining other people’s experiences with this particular trail at this time of year. Perhaps I wasn’t looking in the right places, but this is one of the reasons I decided to start this little portion of my blog. I chose path before I left, but my decision was affirmed by locals when I arrived—many who spoke English. They agreed that the trail might be a bit snowy this time of year, but I could always stop and turn back if necessary. Many chuckled and said as a Canadian, they were sure I was more than prepared for whatever their mountains could offer. I arrived at midnight in Sunndal. Though I had corresponded with someone from Sunndal Camping, they didn’t speak much English and I did not know for sure whether I was expected. Nevertheless, I plopped myself down near the waterfront in my sleeping bag, and hoped they wouldn’t be too upset on finding me there in the morning. Indeed, the next day I found a sign that said that was fine for those who found their way there to set up and pay when they could find the people that ran the facility. As such, I paid my way and off I went up the mountain. It was frigging beautiful. I was blessed by mostly sun and warmth. You can see that from my photos, eh? May is a great time to do this hike, I was told—if you bring your snow-scaling equipment. I only made it to Gardshammar, as there was only snow as far as my eye could see past that point, on the other side of the mountain. I was passed by a hike-ski squad, and one member told me it’s a trail they do every year, though generally later in the season. I spent one night in my tent on this trail (not sure if I was technically allowed to), and I climbed down the next day. I spent that day hiking around the lake. I even took a swim, meaning I can now say I have swum in glacier lakes on two continents. This entry was posted on June 4, 2014 by allendria in Photography, Travel Tales and tagged hike, lone, Norway, Sunndal, travel.